Cross-section of a high-temperature wire. Two layers are at play. The inside core, and the outside jacket together surround the electrical current. In the coming years and decades, the expansion of renewable energies will also play a key role in fighting the causes of climate change. By 2030, the share of renewable energies in Germany’s gross energy consumption should be 30%, making it around twice as high as in 2016 (14.8%). By 2050, it should have doubled again. The aim is for the share to also increase on a European level – by 2030, 27% of gross energy consumption should be covered by renewable energies. Substantial investments are required for this comprehensive conversion of energy supply. For more than 20 years, the BayernLB Group has been financing the expansion of renewable energies in Germany and around the world. Deutsche Kreditbank AG (DKB) is our partner in domestic projects and projects with a volume of up to €40 million. BayernLB provides support for larger projects in Germany and abroad. 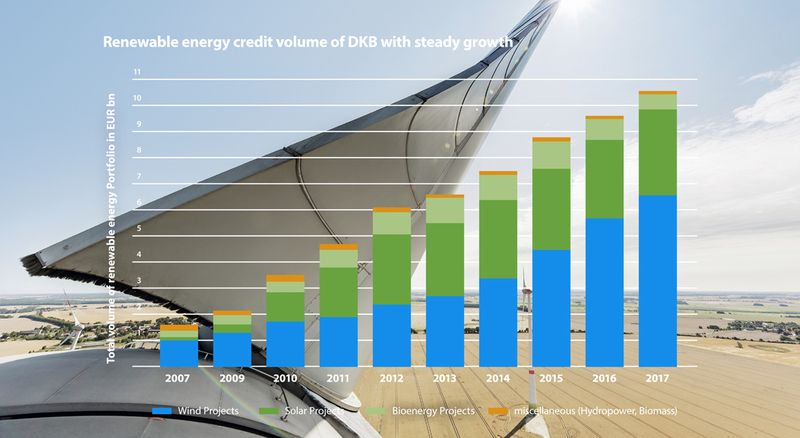 With a current volume of more than €10 billion, DKB is among the largest financiers of wind, solar, hydroelectric and biogas plants in Germany. The bank already has the future in sight: in addition to the established generating technologies of wind, photovoltaics, biogas and hydroelectrics, the focus is increasingly on innovative technologies such as power-to-X, e-mobility and battery storage systems, as well as projects that combine different energy solutions across sectors. This is because it is only when energy generation, storage, distribution and consumption are intelligently linked with each other that the energy transformation can succeed. This connected approach also reflects DKB’s business model, in which operators of energy generation plants, public utilities, energy suppliers and municipalities are counted among their customers. Having a precise knowledge of the requirements of the energy sector, primarily technical innovations and legal frameworks, is the driver in developing suitable financing solutions for this dynamic market early on. This includes low-interest financing with long terms and cashflow-oriented project financing models. The basis for this is interdisciplinary collaboration between financial specialists and technical specialists, including a number of process engineers. Decentralisation is one of the key words of the energy transformation. Here, energy is generated and used locally. However, decentralisation also means that the local citizens are directly or indirectly involved in the energy plans, simultaneously increasing acceptance within the community. Included in the plans are wind farms and solar parks and participation in landlord-to-tenant electricity supply models, in which locally generated electricity is used by the residents at favourable terms. DKB has been specialising in this topic since 2012 and already supports 100 public and private civic participation projects with a volume of more than €50 million.